The serum anion gap is a common tool used in clinical practice. Recent advances have led to a new mnemonic GOLD MARK to differentiate the various causes of anion gap metabolic acidosis. 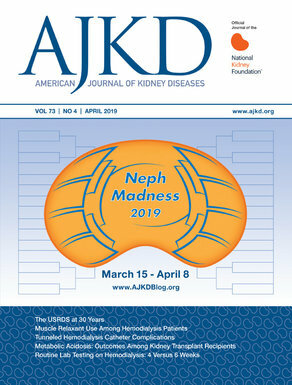 A recent article in AJKD by Vichot and Rastegar discusses the use of anion gap in metabolic acidosis. The following questions will test your knowledge on this very important topic in nephrology. Post prepared by Dr. Helbert Rondon, eAJKD Contributor. To avoid formatting issues, we recommend using the PDF version of the questions & answers. The serum anion gap can be calculated by which of the following? Correct! The serum anion gap can be calculated by the difference between the concentration of measured cations (Na+) and measured anions (Cl- and HCO3-). Potassium is usually not considered as one of the measured cations because of its small and relatively fixed contribution. However, the serum anion gap can also be expressed as the concentration of unmeasured anions minus the concentration of unmeasured cations. The unmeasured anions are composed mainly of proteins (e.g., albumin) with minor additions from organic (e.g., lactate) and inorganic (e.g., sulfate and phosphate) acids. The unmeasured cations are largely represented by potassium, calcium, and magnesium. What reference values should be used when deciding whether a patient has an abnormal serum anion gap? Correct! The reference range for serum anion gap was classically established by the technique of flame atomic emission spectrometry (FAES) in the 1970s. This range was set at 12 ± 4 mEq/L ever since. With the development of ion selective electrodes (ISE) technology in 1982, the new reference range was reset at 6 ± 3 mEq/L. It seems that the ISE technique causes a lower estimation of serum sodium and a higher estimation of serum chloride. However, given the wide range of the normal anion gap and the variation in different laboratories, the serum anion gap should be compared to the baseline serum anion gap for the individual patient when deciding if a patient has an abnormal serum anion gap. Which of the following is most likely associated with a low serum anion gap? The concept of “delta AG/delta HCO3-” is used to diagnose mixed metabolic disorders by assuming that the changes in AG and bicarbonate are numerically equal. This does not apply to type A lactic acidosis where the ratio is usually around 1.6. Which one of the following contributes to this higher observed delta/delta ratio in type A lactic acidosis? Correct! The 2 most important limitations for the use of the delta/delta ratio are: (1) Hydrogen ion volume of distribution is not limited to the ECF with more than 50% of hydrogen buffered intracellularly. This will decrease the drop in serum HCO3-, and increase the delta/delta ratio above 1:1; (2) Many acid anions contributing to the serum anion gap are eliminated along with sodium or potassium in the urine. This will limit the increase in serum anion gap, and decrease the delta/delta ratio below 1:1. In ketoacidosis, the above 2 conditions occur simultaneously, and the delta/delta ratio is close to 1. However, in type A lactic acidosis only the first condition is met. Systemic hypoperfusion causes renal underperfusion and limits the elimination of lactate by the kidneys, causing an increase in the delta/delta ratio approximately to 1.6. In other types of high anion gap metabolic acidosis it is possible to encounter other unmeasured anions that can significantly increase the serum anion gap, such as phosphate or hyperalbuminemia from hemoconcentration. Which one of the following is not a risk factor for pyroglutamic acidosis? Correct! A review of the literature on cases of pyroglutamic acidosis shows that most patients are women, malnourished which predispose to glutathione deficiency, and have various degrees of reduced GFR. Other factors found in case series include sepsis, chronic alcohol abuse, and liver disease. Warfarin use is not a known contributor to this disorder.